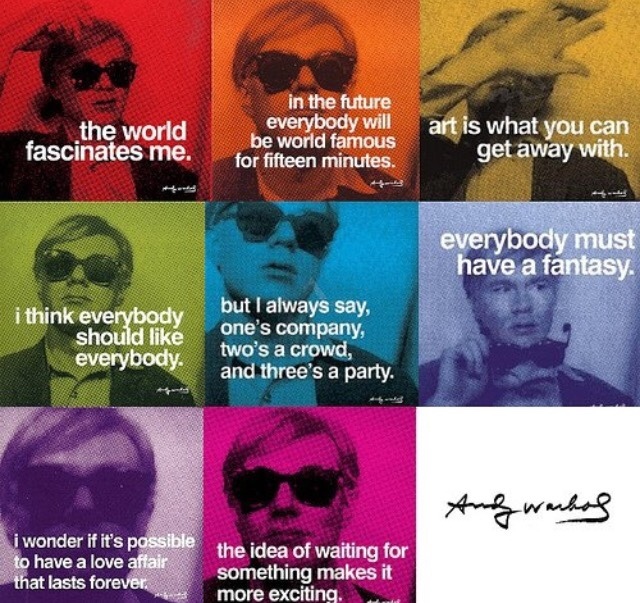 touches of sense...: Wasting time with Warhol. At the back of the cupboard lay a muddle of Dinky toys, a bundle of ancient felt-tip markers and a set of cards kept together with an elastic band. What were these strangely faded picture cards? I picked them up and studied them. Each card seemed to have a pair of identical blurred landscapes printed side by side. As I was about to lose patience with the cards, I came across a pair of flimsy beige plastic glasses held together with Sellotape. I put on the glasses to see what I might see and then realised that they were connected to the faded cards. On moving the double image of the Grand Canyon, it suddenly clicked. I viewed the whole set of cards, travelling to the Taj Mahal, past plains Indians, all the way to Hong Kong harbour. Now all of this got me thinking. Susan was talking about the randomness of some apps which basically hijack your photos or videos, doll them up fancy-like and leave you dumbstruck at 'your' artiness. We could add any number of photo-tweaking apps which keep you sweet and engage friends and various Facebook friends or Twitter followers at 'your' technoarty prowess. Its all painting by numbers gone crazy. Click, click, click, I'm a bloody genius! Click, click, click, I'm bloody Warhol! Click, click, click, I'm bloody Warhollow!!! Click, click, click, I'm bloody click-bait!!!! I have been feeling rather uneasy with all of this digital 'making' lark, like, liking. What is it we are really sharing? Our need for recognition for our heart-felt endeavours? I spent hours on that drawing. It was black and white on A4 sketch pad. It was all that my soul could muster. It was met with a beautifully gloved hand and an embarrassed smile. I am often disappointed by my intentions. I am often astonished by what is unintended. I have largely given up intending. I am crap at intending. I am more 'skilled' at unintentional. 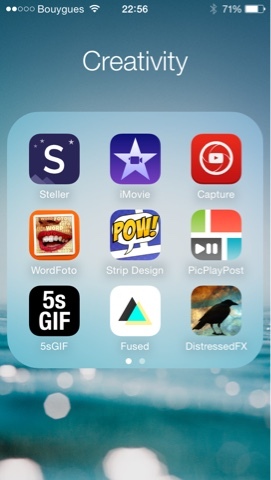 The photomontage above came from messin' with apps. I am good at messin' with. I didn't code the bloody app. I am a slave to its genius. 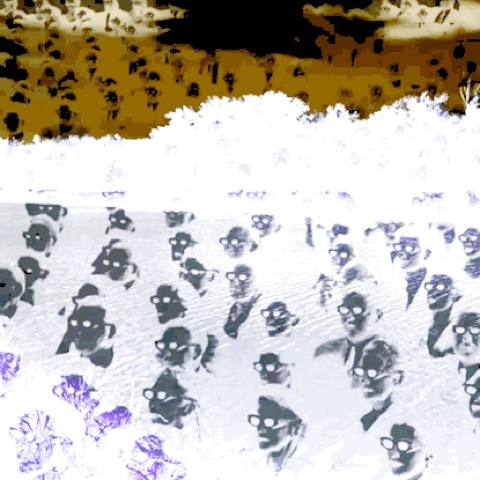 I juxta-posed a video I took today of a river with an iconic image of cinema-goers wearing 3d glasses. I fed the video through a 5sec gif app. I mixed and tweaked all of it with Fused app. This image has a resonance for me here. Those 3d glasses helped me to contemplate an unknown world with different eyes. I spent a few hours playing. Those hours are reappearing here. I spend hours wasting time like this. I wasted a few more minutes here thanks to Susan Watson and Terry Elliott. I hope they will appreciate their role in my time wasting. Andy Warhol gets in here as a footnote. It's such a temptation to not leave a comment because I want think, digest, render it in my mind. Then how do I return to this place? So I pause, right now and say....that the sentence that resonated with me was 'our need for recognition'. Yes I create because it's fun and gets my brain thinking but why do I share? So I can connect and have someone say 'fantastic, well done'. The expectations of sharing is what brings the disappointment when it's not met. I pause and move one but carry this moment with me.